Currently, Hilton is running a great promotion on hotels everywhere in the world giving up to 35%. This is pretty much their standard “Winter Sale” Offer. 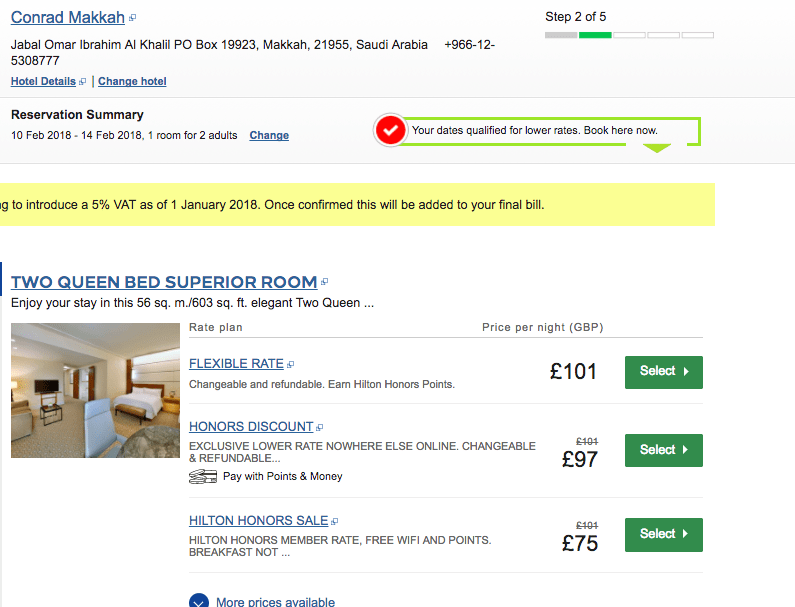 But while looking for hotels in Makkah I realised that they are extremely cheap for booking in February 2018. Some are total bargains and I couldn’t, not share them with you. Here is an overview of the hotels for February with the highest being a 5-star hotel for £75. 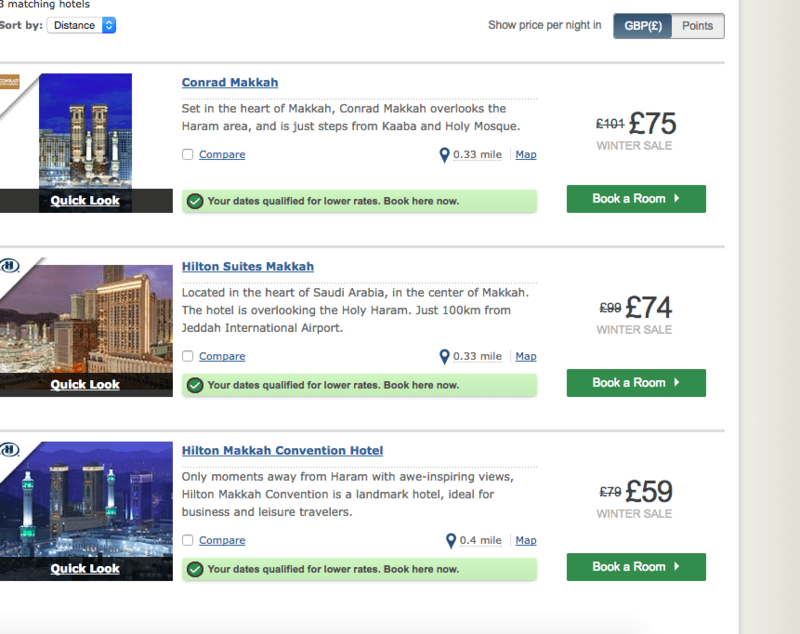 The new Hilton Makkah Convention Hotel is approximately 5minutes walk and it costs as little as £59 per night for two people sharing. If you want to add breakfast it is £70 per room. Click on the images for the desired hotel and deal. Hilton Suites which is also an amazing property 1-minute walk to Haram is £74 and it also has a small kitchenette which can be very handy for families travelling with kids. The amazing new Conrad Makkah Hotel is about 3 minutes walk to the Haram and it costs £75 which for a luxury hotel is a bargain price. If you are a Hilton Gold/Diamond you can also receive upgrades, free breakfast and lounge access (upon upgrade for Gold, guaranteed for Diamond). If you are not Gold/Diamond Hilton Honors member you can still purchase an Executive room for 105GBP which is a great price considering you get free breakfast, drinks throughout the day (handy after Tawaf) and snacks in the afternoon. All hotels are brand new or almost new (Hilton Suites) and with these prices and standards, you really are getting a bargain. This is the reason why I love travelling and going for Umrah off-peak season. 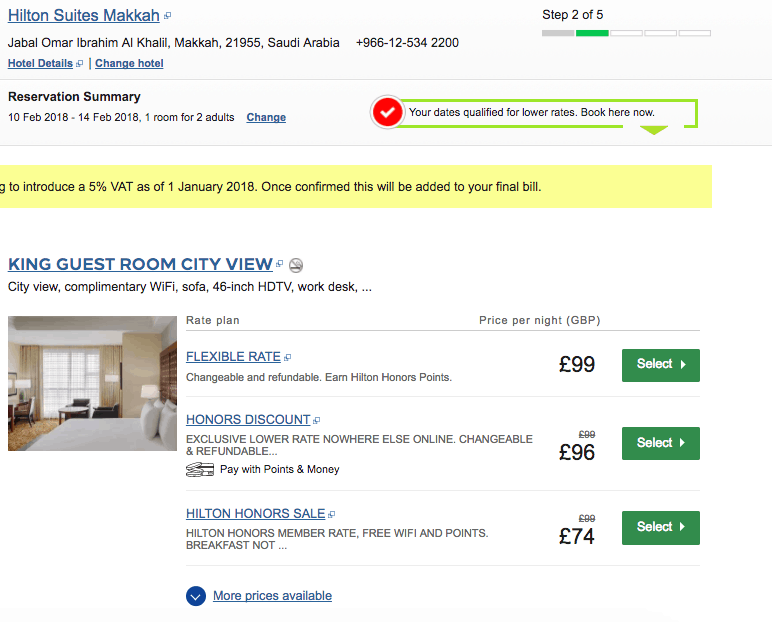 I am very happy to see hotels in Makkah are becoming more affordable and certainly for Hilton before the closure of the Hilton Towers the Hilton Suites property was much more expensive than what it recently has been. To book the hotel please do use MuslimTravelGirl’s link as we do earn a small commission to keep this website going. As always thank you for all your support and love. These prices are unbelievable. I would recommend everyone to book it right now and make your travel successful. Thank you for sharing this with us. I am on my way now.